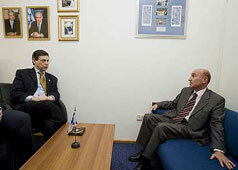 How are we to relate to the actions of our Deputy Foreign MInister, Danny Ayalon? He invited the Turkish Ambassador Ahmet Oguz Celikkol to his offices, and staged a calculated demonstration of displeasure at anti-Semitic sentiments emerging from Turkey. He directed photographers to note that the Ambassador was sitting on a lower chair, that the Turkish flag was not displayed, that he did not shake the Ambassador’s hand, and more. On the one hand, a clear and vocal strand of Zionist thinking put forward the idea that a State of the Jews would allow us to stand up for ourselves. The machinery and power of a state would finally give us the opportunity to reject anti-Semitism in a strong and uncompromising voice, and unashamedly defend Jewish interests. Though there were and are other Zionist voices, we might see Ayalon’s actions as fully in line with this strand of Zionist thinking. On the other hand, a significant strand in Rabbinic literature speaks unequivocally against humiliating others. “One who humiliates his fellow in public has no place in the world to come” (Avot 3:11) Our Sages have gone on to say that humiliation of another in public is to be compared to murder, and even suggest that the punishment for such a crime should be death. In this context Ayalon’s actions were in direct opposition to Jewish tradition (though others such as the Rambam might have offered him a loophole). How should we judge our Deputy Foreign Minister’s actions?